First off, here is my shameless request: A quilt I made was the basis for an Instructable “ible” for the “Sew Warm” contest that they are having. If you haven’t, I’d appreciate it if you would vote for me. If you have voted, you can vote again! I know that this is a shameless plug again, But I really want to win! Please go here and vote! I have under the weather for some time, each time I thought that I was getting to feeling better, I’d have a relapse later in the day from trying to do too much. 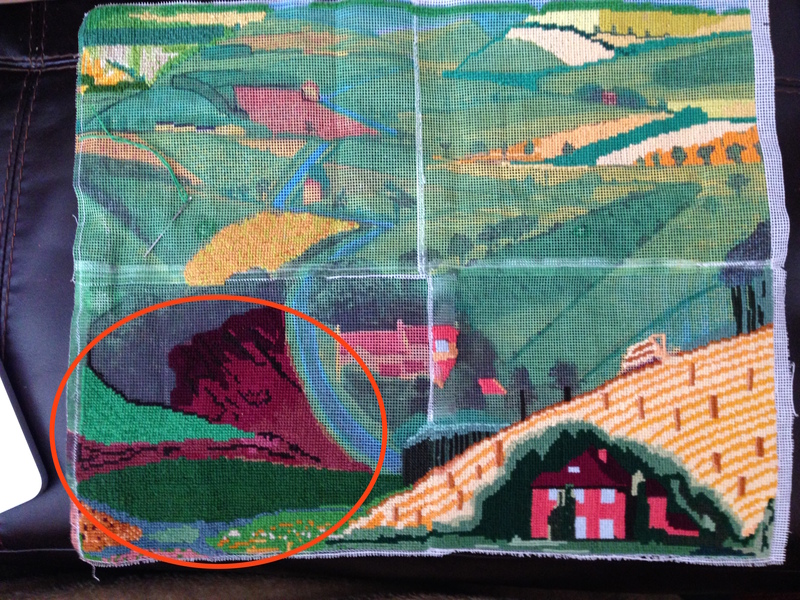 But, I did turn to my needlepoint (or cross stitch) to make the time pass while recuperating. I ran across the pattern on Pinterest (don’tcha just love that site?) and thought it would be something that might be relatively straight forward and not take too much time. Something I could pick up and put down easily. It did go pretty quickly. Here is the piece almost done. About two thirds complete, I decided what I was going to do with the final piece and made the curve along the top edge. And here is the finished piece: an eyeglass case. I lined the inside with those microfiber cleaning cloths, so it will never scratch the glass. Other than my stitching the two edges together seeming a bit wonky, I think it turned out pretty good. I also ordered sewing pins from the internet… I am one of those people who sew over pins although I am sure my first HomEc teacher would be out of her mind to hear this! The biggest problem I have is bent pins and I always throw those away. I do seem to go through them at a pretty good rate. So, another thing I could do while laid up in bed… put pins from cute little containers into pin cushions. The majority of the pins went into two very large tomato pin cushions that I use religiously, but this was enjoyable. The Kid thinks I am a nut! Sometimes it is so amazing how quickly time goes by. I always thought that time was like a bell curve, when you were young, time seemed to go so slowly and then speed up as you entered your twenties and then sped up until sometime in your late forties or so and then it would start slowing down. Even though I am not working, each day seems to alternatively just go by in a blink of an eye and then sometimes, the days can just drag on and on. Anyway, this last couple of weeks have seemed to just flash by. I have always tried to write consistently… rather than have the blog just sort of fade away. When I feel like I have nothing left to share or learn, I will just say so, say goodbye to my readers and stop. I am not ready to do that yet. So, although I haven’t written recently, it isn’t for lack of projects! Every so often, I have to stop myself and focus on a project until it is done. I get one started and then I have my attention diverted and get started on something else, and before you know it I have eight things going and nothing getting done! On top of that, The Kid and I went out to pick up free Tiger Lilly plants for replanting in the back yard and while trying to load them, I tripped and fell. I may have cracked a rib, at the very least I bruised something, making it tough to really do much at all. Every move hurts and it really puts a damper on most of my projects. There is one that is doable, and it started a little while back. When I dug out all my Pyrex and got a little more involved with it again. I want to take the doors off the cabinet above the stove and display the Pyrex I collect for me, the pattern is called Friendship or Friendship Birds. Its mostly red with a heavy sprinkling of this light orange. I think I could just take off the doors and rearrange the shelves, but I work because it sits above the microwave vent and I worry that it might get greasy (the doors do!). Maybe I could place a framed piece of plexiglass or something over it. I am still thinking on this idea. But the other idea it sparked was another cross stitch. Using my favorite Pyrex pattern, I drew out the pattern. I am going to “frame” it in a embroidery hoop, I’ve already painted it red. Turns out that cross stitching I can do that doesn’t aggravate my cracked rib. So, between the stitching, harvesting denim from old jeans and sewing denim quilt squares, I have been keeping busy. I will let you in on my secret of getting old denim from jeans for practically nothing soon. In addition to the mostly blue but some black and white, I have found some really great colors – and a leopard print! – which I am going to make a really colorful denim quilt down the road. I’ve also added much to my denim stash: side and bottom seams, belt loops and pockets! Like I said, so much stuff started… getting nothing done! Oh yeah, and in between all this, I am still job hunting. Although it may not seem like it, I still love the work I do in computers. There is a career that is never boring and always changing. It has done well for me. Come back soon for updates! I have been working on the project for, well, it seems forever! I did a rough estimate of what it would take to do a square inch and it was more than 30 minutes. And with more than 300 square inches. Figuring in the time it took to make the canvas, bind the four canvases together and the time in between to thread needles and choosing colors, I estimate that it took me around 200 hours! It was all based on this painting I saw in a magazine. Over the years, I would pick it up from time to time and work on it. But too much time spent with it and I would get a little antsy, feeling like I would never finish it. But I kept at it and now these long five years later, it is done. In all of this project, the single biggest issue – other than the sheer volume of canvas, was the difficulty of connecting the four canvases. 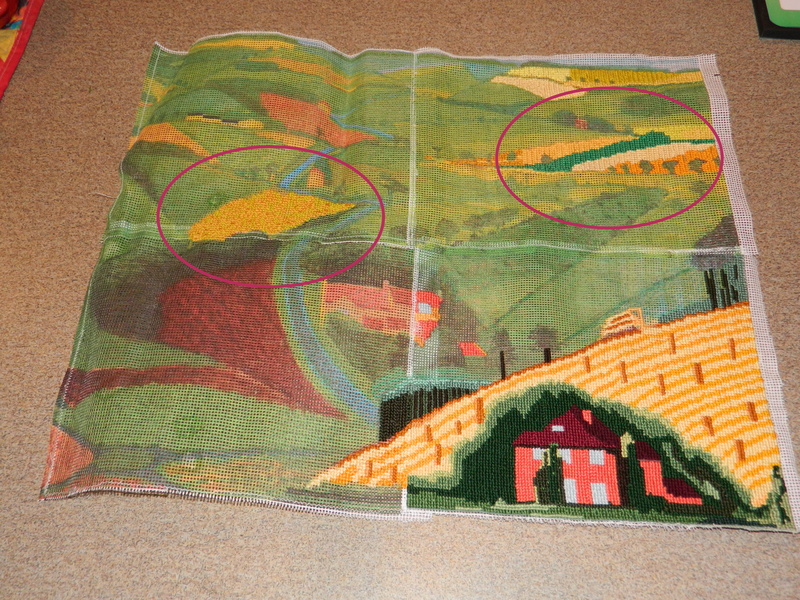 In many areas, although it is difficult to see in this photos, there are rough areas where the cross stitch doesn’t quite look right or nice. But from a little distance, it looks okay and once I get it mounted and framed and behind glass, you’ll hardly be able to see it at all. I am slowly but surely whittling down the project list. I actually have a little red notebook that I wrote down all of the projects that I have started (with the exception of quilts… it would take many notebooks to write them all down! ), and am slowly making my way through it. But as I should soon be returning to a full time 9-to-5, I really want to finish some of these projects (like this one) that have been sitting unfinished for way too long! One thing I have been trying to do is to get my photographs in order. Its not easy when I have a multitude of cameras and photo devices and then too, a number of computers that I use on a regular basis. I need a server and then about six to eight months to get everything organized! This morning, I have already spent a good chunk of time trying to locate my “before” pictures of this sewing machine cabinet I have completed. Its been done a while and just sitting in my foyer. Today is the day I make it a priority to get it ‘gone’. 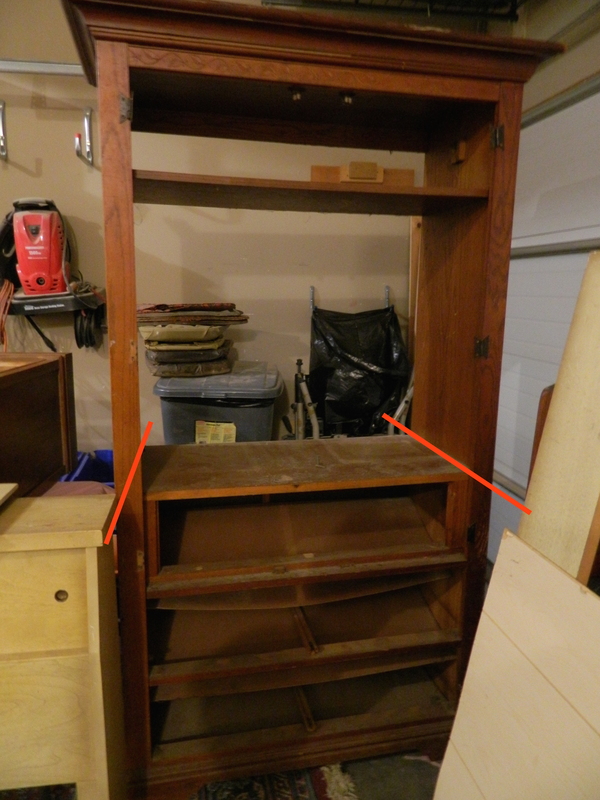 A while back, I picked up a couple of sewing machines in cabinets… I mostly got them for the cabinets. I have enough sewing machines that need repair, I don’t need to add to that sewing machines that are forty or fifty years old. This is the last cabinet to be completed. It originally was just the top with the four drawers down the right side, but I enclosed the other half, added a glass holder and an ice bucket and painted it in a festive turquoise color. The black of the cabinet is such a vivid contrast! I am just going to show the photos I have found and later will update them. Its funny as the color photographs different in different light. It really is a wonderful, bold turquoise, reminiscent of the fifties. Work continues on the dollhouse, I’ve opted to paint all the interior walls and lay all the flooring at the same time (instead of one room at a time). I’ve recently ordered the necessary cabinets for the kitchen and things are moving along. I’ll give you an update soon. Another project that I was able to finish was the transformation of these large plastic tubs into Lego storage devices. Me and The Kid love red vines and I have been saving these for something important for some time. 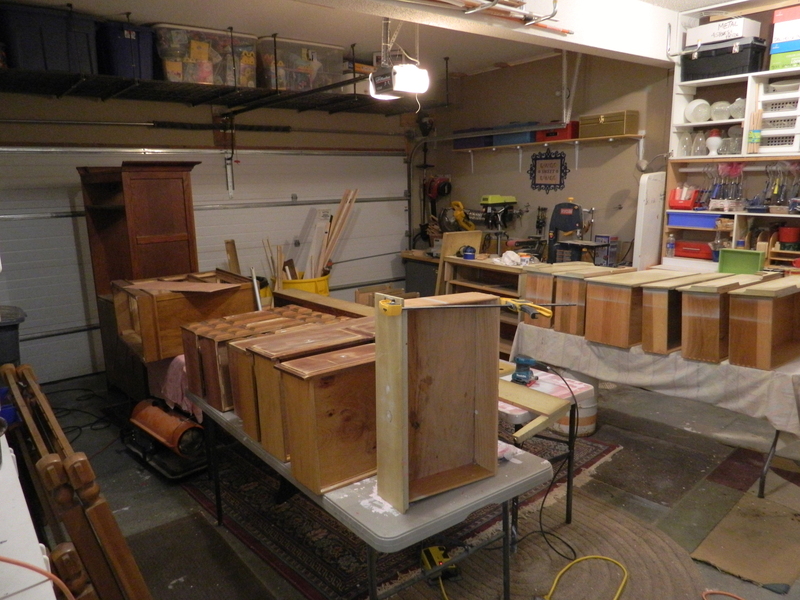 So, now on to working on organization and more dollhouse work. Work has had me worn out by the end of each day. Seems like I have the best of intentions but no energy to carry out the work for the blog page. But little by little, I am getting a few things done. The first I am going to talk about is something that I really love… from the initial idea to its completion. I am really, really in love with this project. 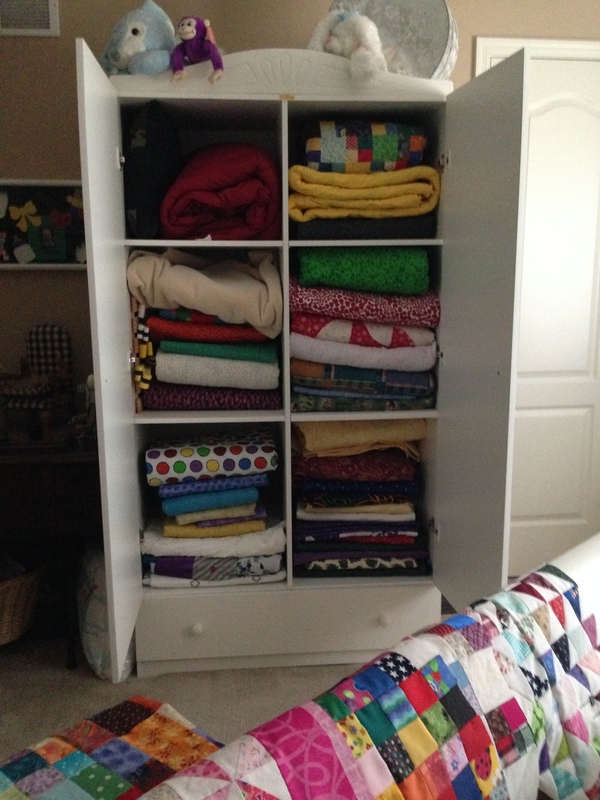 The conception of this little project was picking up – for free – the sewing table. A very simple design with the flip open top, a run-of-the-mill design for sewing machine tables. But it was in very nice shape and I loved the simple, elegant design. I began by removing the top. I also removed from the front the flip down pocket from the front. A simple wipe-down of the remainder brought it back to the deep rich original finish. Some time ago, like over two years, I picked up some Corian countertops from CraigsList. I didn’t know what I would use them for, at the time, but I always knew that they could be transformed into something beautiful. Part of the countertops – the island piece, I believed – became the top of a beautiful cafe-style table and chairs set. You’ll note that this set’s table is also sewing related! The chairs were fitted with matching Corian seats. Isn’t that adorable too? Well, we’ve learned – The Kid and I – that Corian can be cut, sanded and routed the same as any wood. So, I wanted to make the top for the new table from the remaining pieces. Initially, laid out in the workshop, I drew a nice little rectangle but knew that would be too boring. I recently purchased a new template for making curved edges for quilt and the paper label was lying in the recycle bin right in eye sight! I used it to draw the nice half circles around the edges and with a little fidgeting, it turned out perfectly. It took nearly half of the longest and widest piece of the Corian, you can see in this picture what was left as well as the reverse of the curves of the cutout piece. This sitting like this gave me the idea to use the same design to create a matching mirror. Wouldn’t this look cute in the entryway of someone’s home? Or a little place in the kitchen to dash off a recipe or keep a computer handy? The piece was cut using a jigsaw and then routed top and bottom. I opted to keep the inside edge of the mirror pristine, I think the routing would have detracted from the edge work. It was fitted with a mirror and backed with a lightweight backing and then taped with a finish tape. 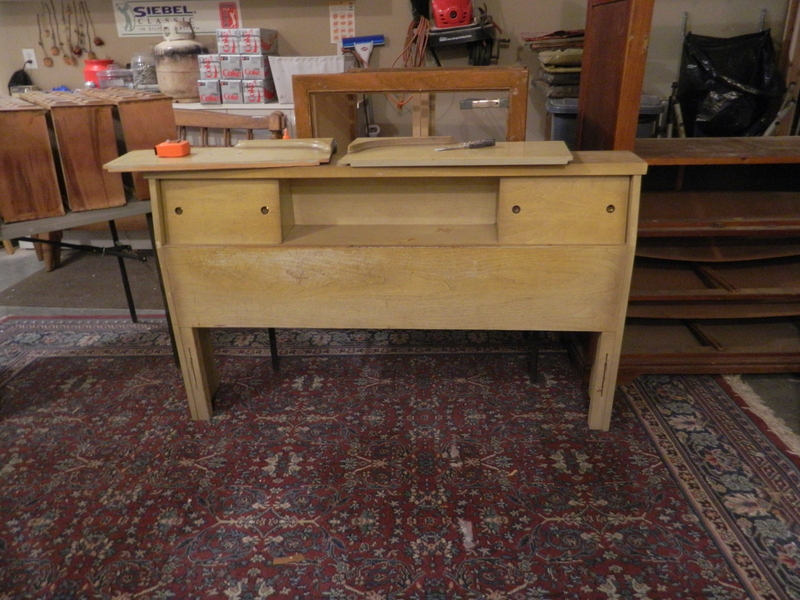 The drawer front was connected to a larger drawer, one that was salvaged from the desk turned small cabinet (and decoupaged with Atlas maps). It was the perfect width, just needed to be cut down to a size that would fit the cabinet. I love that this piece was re-made without a penny being spent! Everything is remade/recycled from free materials picked up from CraigsList. I kept the tilt-out piece and just added the drawer. The Kid was crafty enough to configure a drawer tract and put it all together! Another project finished! I’ve also worked on a couple of smaller projects at the same time… I always have to have my hands doing something! I finished cross stitching the little pillow for Mattie (hi Mattie!) to help her to remember that cubicle walls don’t have much sound protection! Just a little pillow, about 4″ x 7″ that sits under her monitor. She picked the colors and I just happened to have the perfect fabric to use for the back. I also put together this little card holder for my blog cards. It is simply two drawer pulls on a scrap of really nice wood that I had leftover. I sanded the edges into nice rounds and attached the handles simply by drilling holes into the surface and sinking them into it. No gluing, no painting, no fuss! It works for either vertical or horizontal cards. Pretty neat, if I say so myself! And last, but not least, I made yet another little shelf with storage bottles for craft items. As many of them before, this one is made from paint sticks! I love the versatility of those free pieces of wood! And I seem to always find one or six of those little jars, so I am quickly filling up the shelves. Well, that about does it for tonight. Tomorrow we have big plans to finish the west wall of the garage… I have to remember to take before and after photos – as well as some in between. Started A Hundred Things… But Getting Nothing Completed! Ever have one of those days or weeks or maybe even months? Ever since I’ve been back from vacation, it seems that I have been having the hardest time keeping on track to completing projects. Lots of things started… between the new furniture pieces and my quilting, it would seem that I have a hundred irons in the fire. But there seems to be so many things preventing me from getting the projects completed. 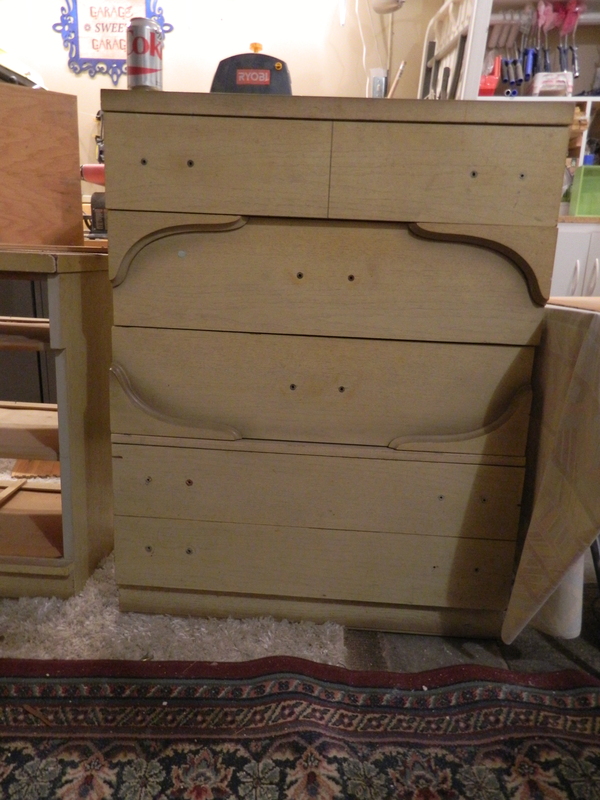 So, first up is the blonde bedroom set we picked up about a hundred years ago (it sure seems like it!!). We had a chest of drawers, a dresser with a mirror and a head- and foot-board. All was in pretty good shape with the exception of a missing drawer and another drawer broken (but it at least had the drawer front). In trying to determine if we could recreate the missing drawer (we had taken the head and foot boards for just that purpose), we determined that it would be too much work. So, we’re going to cut the dresser in half, going from a six drawer to a three drawer unit. 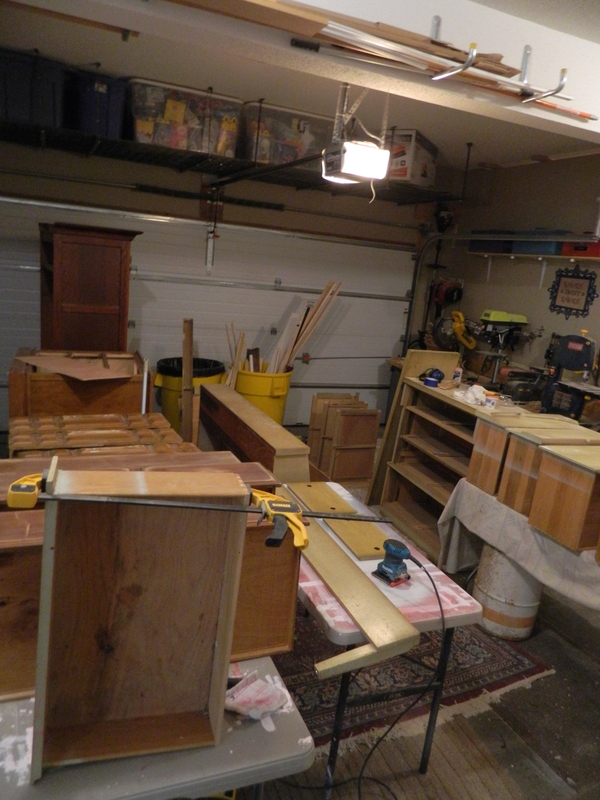 While The Kid works on that, I have taken the other drawers and chests and head- and foot-boards and given everything a nice sanding and patched holes and gouges. It is really a very nice set, well built. I remember my parent’s having a similar set, I would place it sometime in the 50’s, when blonde furniture was all the rage. Here’s the headboard… I think this is going to be finished in pinks, they seem to sell well. 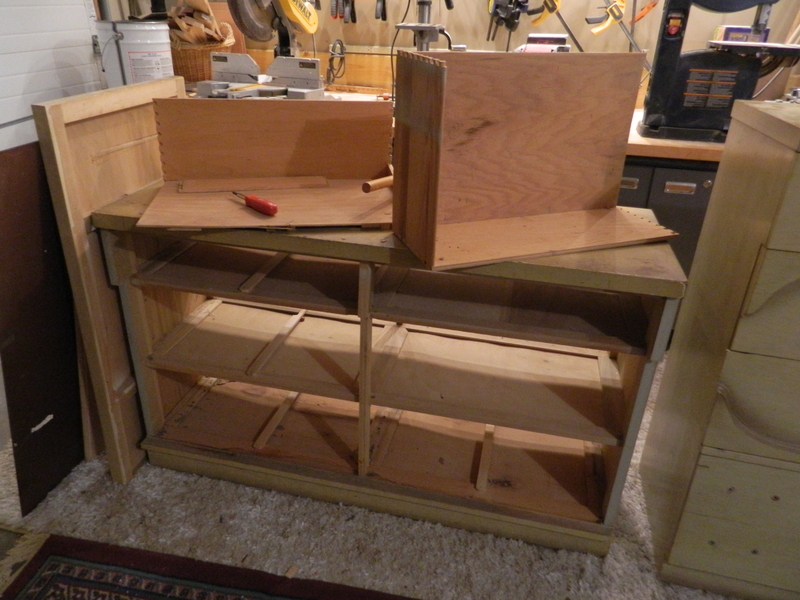 I think the wood corner pieces will be one color and the remainder of the drawer a lighter color. In addition to this piece of furniture, we have a three drawer dresser with a different feature. Originally, there was a large slab of granite on top, which had broke. We’ve fit the top with a bottom and then it will have a clear plastic top, in essence creating a narrow shadow box. I think it will also be the pale pink, and for photos I am going to use doll clothes or something to show off the use of it. I think that this will sell quite quickly. Oh yes, I won two sets of headboards and footboards from an online auction place, we’re going to use them to make those cute little bench seats. The last one I did sold very quickly and had a lot of interest and was so easy to put together. You can see them in the photo above to the very left. At least the weather has been very nice the last few days. Which was great timing since we just ran out of kerosene for our garage heater! In the house, I have a couple more projects in the works. Of course, you all know about the cross stitch. I suppose you are all just sick of hearing about that! I warned you! But I also started digging through the junk in my home office recently. You all know that at times I will get frustrated with a mess and will stop working just to get things organized. Well, my home office had finally reached mission critical! I have two boxes of the stuff that I take to my “real” jobs… the kind of things that make computer work just that much nicer. For instance, I have a custom keyboard and mouse, photos of The Kid, my own pens and markers and calligraphy pens. When I finish a job, I just throw the stuff into a box and wait for the next job. But they’ve started to drive me crazy, as once there is one or two boxes, they seem to just invite more clutter. 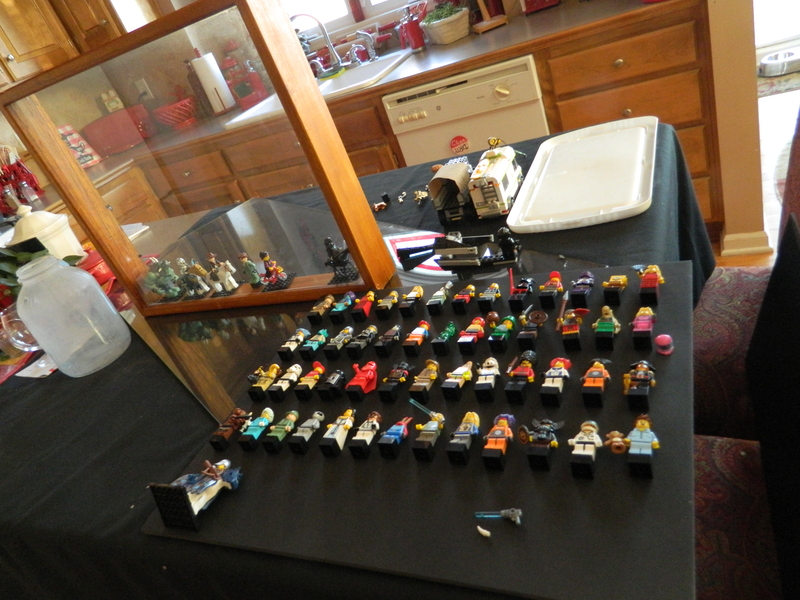 One of the things I had under all that clutter were my Lego Mini-Figs. If you are not a Lego fan, just do a Google search on the words “Lego Mini-Figs” and you will see what I mean. Along with PEZ dispensers, it is one of those things that The Kid and I collect together. He plays with his, mine are meant to be showcased. So, now that I had a decent amount, I started to work on putting them into a shadow box. I ordered black 2×2 blocks for the mini-figs to “stand” on and once they arrived, I started working on the layout. Ever notice that when you’re anxiously awaiting the delivery of something it seems to take so much longer than it should?! I’ll give you an update when I get closer to being done. I did manage to find the right pieces, though, for another small cake/cupcake tray. That ostensibly was the reason for looking for doomed lids, in order to create these small cake/cupcake plates. But I don’t really need a reason. Now do I? And of course, the faux stained glass jars. 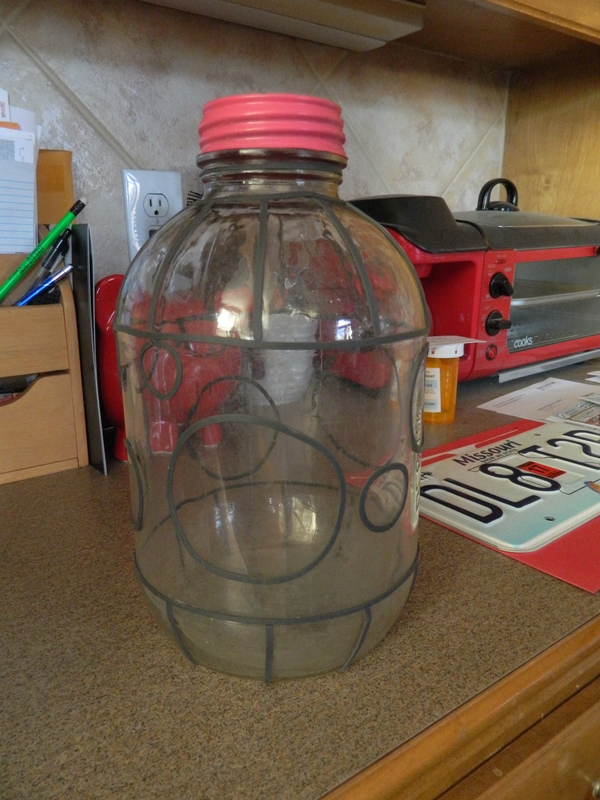 I’ve done quite a few of these, and because we tend to find these bottles when we’re out abandoned house hunting, it is fun to turn them into night lights or ambient lighting. I thought I would do one in shades of pink. Offer it up when someone buys the furniture pieces we’re doing in the ombré style using pink. I like it even more with the micro-glitter with the faux stained glass. Another development on the quilting front. I am a pretty prolific quilter but recently the woman who does the longarm quilting for me, my friend Gloria, opted to retire from providing this service to me. I’ve been doing some searching and also some investigative work into whether I might just invest in a longarm machine and do the quilting myself. I pulled together all the incomplete quilt tops that I could find and I have just over 50 tops (with their matching backs) ready to be quilted. 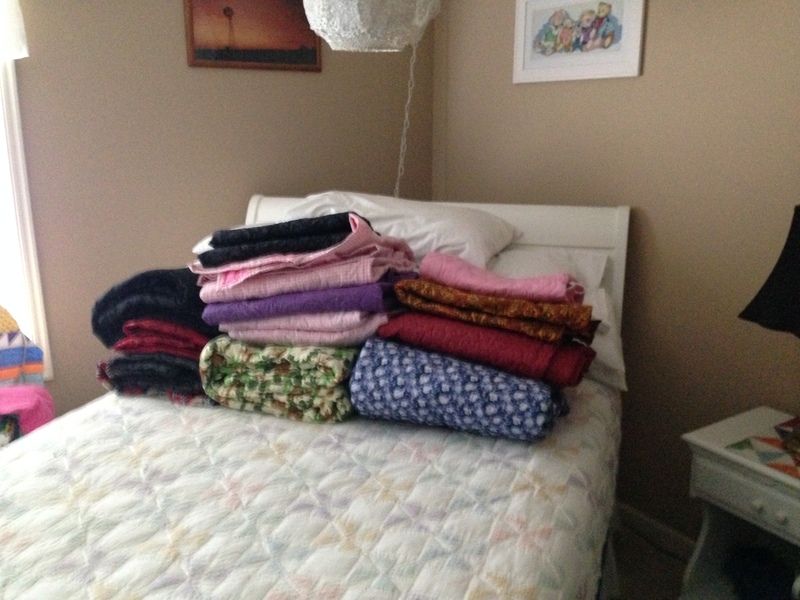 This doesn’t include 6 denim quilts that are a special challenge. And today, I uncovered a bunch (maybe as many as 20) of tops that don’t have their backs prepared yet. And I know that I have blocks cut for probably another dozen or so. Okay, so, I think I found a young lady kind of local who I am going to take for a test drive. I’ve sent her two fairly large quilt tops and backs and given her carte blanche to do what she wants with them. If it works out – and she does seem to have the most infectious energy! – then I am going to drive down and meet her, delivering to her another 50! (Hi Becky!!) I have such good feelings about this. Whew! After almost nothing from me for weeks, I think I might have gone a little overboard! Ha! Feast or famine! I will try to do better about providing more consistent updates. Oh, one more thing and then I will be done. Promise. 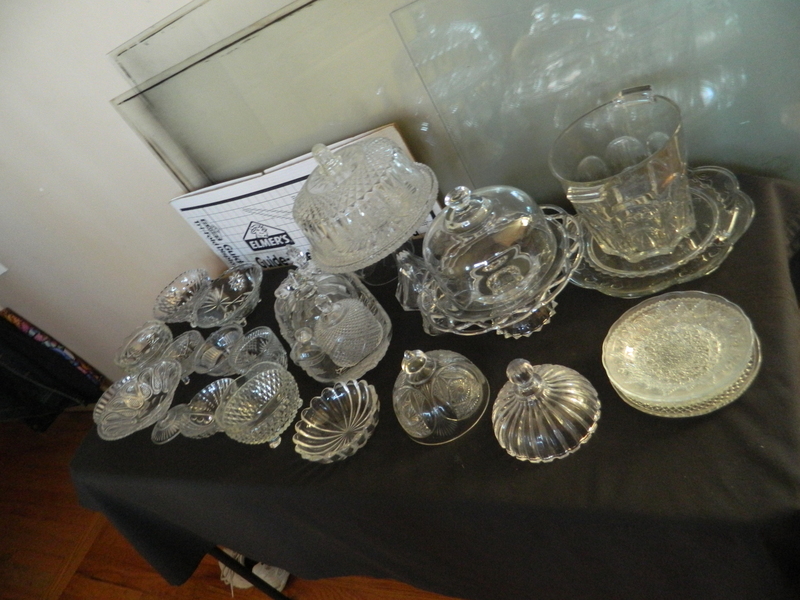 One of the cut glass crystal pieces that I found and bought was for trifles or layered meat dishes. I had always thought they were called “truffles” but I am wrong. I have a recipe for a potato and roast beef thing, but of course, I started with a trifle. 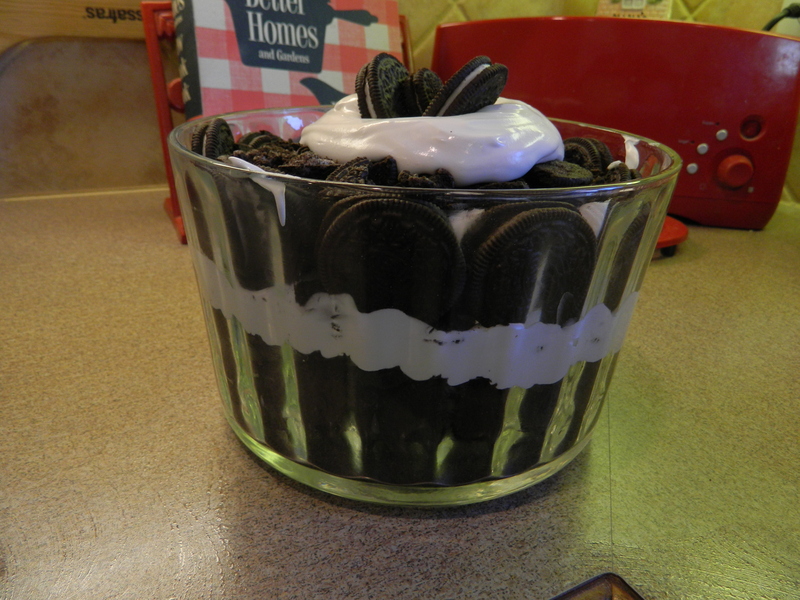 Oreo Cookie Trifle. This has Oreo cookies, vanilla cream, crushed Oreo cookies, whipped cream, mini Oreo cookies and an Oreo cookie crust bottom. 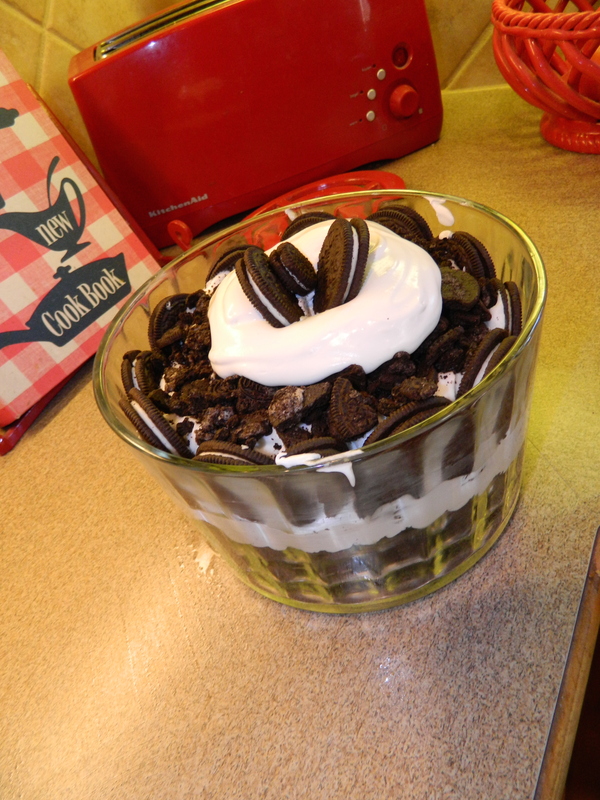 This should probably be called “Death By Oreo Cookies” or something. My blood sugar is rising just thinking about cutting into it!! Thanks for dropping by! These past couple of weeks since we arrived home from vacation, it has been hard to get back in my grove. For anything. Well, not everything. I have been indulging my Netflix streaming account and my cross stitch project. I spend long days curled up on the sofa watching movies and making that needle go down and back up. I’ve almost completed the lower left quarter. For the very first time, I feel like I made real progress. Still a lot to go, but I feel there is real momentum. I am still in a quandry about the quilt tops and buying a long arm quilting machine have been about every third thought. Would love to hear the opinions of other quilters out there. So, when I get frustrated or overwhelmed, I tend to stop creating and start cleaning and organizing. Yesterday was no different. I am a bit overwhelmed in the garage – to the point where I can now not get my car OUT of the garage. Sigh. Also, my home office was rife with clutter, to the point where I couldn’t hardly get to any of the computers. Much less sit down and try to be productive. So, out came the organizing bins and with that, the ‘attic closet’ that I store them in had to be organized so that I could get empty ones out and full ones back in. We started there. Pretty much pulled everything out of the ‘attic’ and made quick decisions on what could be kept and re-stored and what could be donated or thrown away. With much of that done, I had the boxes I needed to work on the office. All the empty boxes that had been collected in my office were sorted by which ones needed to be kept (and organized in a container) the ones that no longer needed were broke down and readied for recycling. That was pretty easy. Carried the containers up to the ‘attic’. We had a pretty large pile to be donated and that went into the truck for the next trip. The containers all went back in nicely organized by size. But then the brakes were hit! Quite a few months ago, I organized the quilt tops that had been finished and awaiting quilting. I sent one large box off to my friend Gloria for quilting and set the other box back into the guest bedroom closet (closet, not the ‘attic storage’). I really had thought that there was only one box left. I really felt like I was making a dent in getting quilts quilted and then bound and completed. In yesterday’s flurry of organization, more boxes were uncovered. First it was one. I sighed. Then another was uncovered (it began to feel more and more like an excavation). I called The Kid over. We removed more boxes and there was number three and four. Holy cow! I also took one box and loaded into it all the denim quilts awaiting the discovery of someone who is willing to take them on. I think I broke Gloria’s machine with one of the last denim quilts she quilted. 😦 For this I feel really bad. 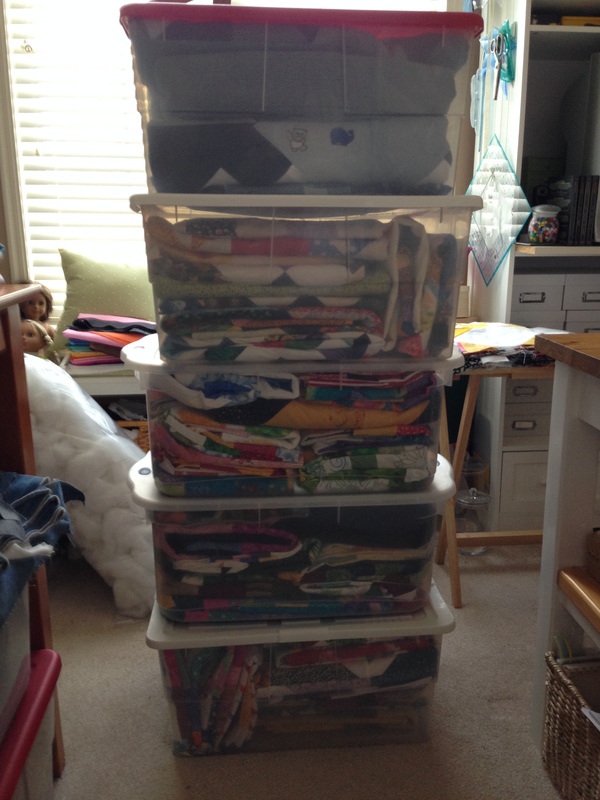 So, I moved all of these boxes into my sewing room. I have to figure out something. And until I do, I cannot – CANNOT – start any more. This is nuts! I also have a large armoire in the guest bedroom which was my baby’s storage in his nursery. It stores TONS of quilts. It is now pretty full. And another dozen or so finished (at least they are finished!!) are sitting on top of the guest bed. I suppose this is where I am grateful that I don’t often have guests!! I am plan ning on counting all the unfinished quilts which should allow me to do some math. I am beginning to believe that I could invest in my own long arm machine and would be cheaper in the long run than paying someone else to do it. Oh, by the way, I did some searching on the internet to find someone to hand quilt my rescued quilt top and I found one woman who priced a queen sized quilt at $15,000. No, there isn’t too many zeroes or any typos. Good grief… if I thought I could get someone to pay me those kinds of numbers, I would totally do it! I can’t imagine! Can you? I am hesitant to even mention the dozen or more quilts that are already in process… I’ve either cut for blocks or have the blocks and just need to assemble. I am so overwhelmed by all of this that I have decided to go watch a movie and do more cross stitch. Right?!? !